Posted April 7th, 2019 by alexa & filed under Portraits. The very lovely Stephanie and Sam are getting married in July. Their wedding celebrations are taking place over three days on a farm. The whole wedding sounds amazing and I can’t wait! 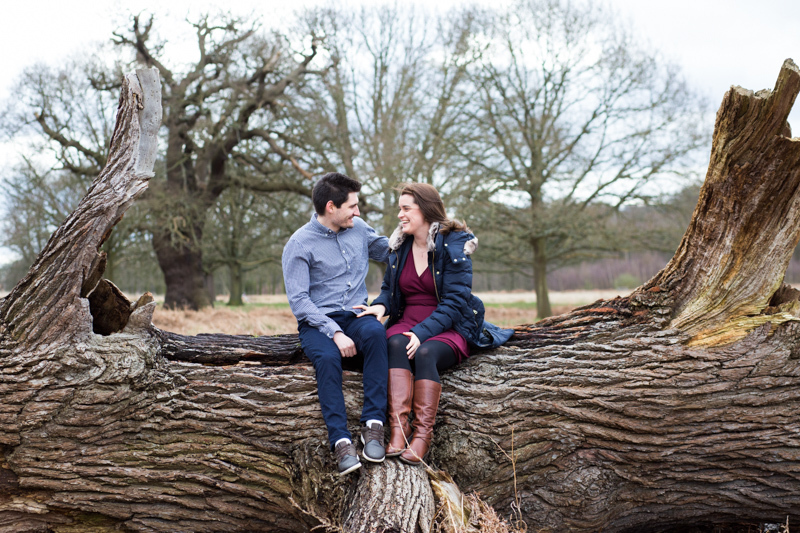 For their engagement shoot we met up in Richmond Park one dramatic windy day a few weeks ago. I’ll be sharing more of the photos from their pre-wedding photography session soon. But for now I wanted to show you one Richmond Park Engagement Portrait from our morning together. Stephanie and Sam are very sporty and like nothing more than a long walk in a park. We decided Richmond Park would work perfectly for their engagement photos. And there was no way the weather forecast was going to deter us! It was a very chilly and windy day, but we were all in high spirits when we started the photography session. Even the sight of a tree blown down by the wind on the drive to Richmond Park didn’t put us off! Richmond Park is a stunning park, famous for its wide-open spaces, grasslands and roaming deer. When you’re in the middle of the park it’s hard to believe that you’re so close to central London. We had such a fun time chatting about their wedding day and taking some natural photographs. I’m so happy with this engagement portrait of them sitting on a huge fallen down tree trunk. I love the frame that the two large branches make either side of the couple. And the backdrop of more trees behind them in the distance is so beautiful. Stephanie and Sam chatted and laughed all the way through the photography session. You can just see how happy they are together in this image. I’m so looking forward to their farm wedding – I can tell it’s going to be an incredibly relaxed occasion and so much fun! If you’re getting married and looking for a London Wedding Photographer, please do get in touch so we can chat about your wedding plans. Or if you just fancy a couple’s photography session I also offer these as stand-alone shoots. We can find the perfect location in London to match your personalities and create some fantastic images for you to treasure forever.